1. Do the assigned reading. 2. Get to know the people on your course. 3. Learn the MMF 2.5 software. 4. Play lots and lots of games! This sums up the first week of games theory and design, a course where booklets are decorated with Scott Pilgrim characters, students have access to all the consoles imaginable and professors quote Star Wars on a regular basis. 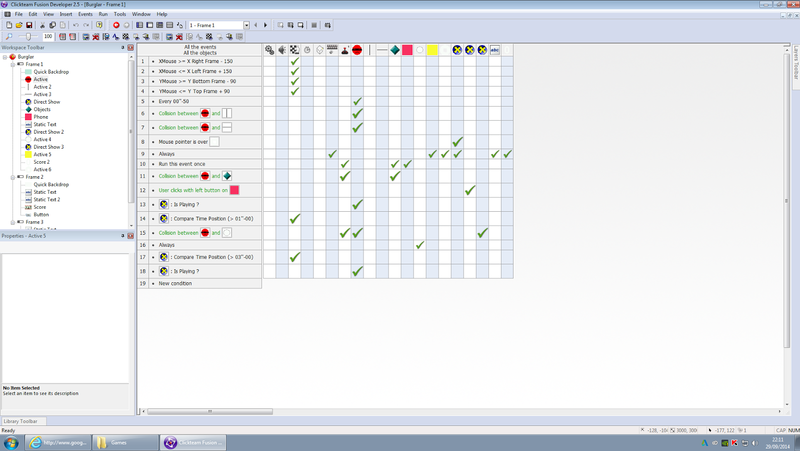 As a challenge to myself as well as for record keeping, I shall be attempting to record the progress of the course. It has proven to be a very intense program with every day being worth of an entire blog post. To make things easier I will briefly comment on various activities then concentrate on one particular detailed high-light for the week. Most of this week was spent discovering new games and getting to know classmates. 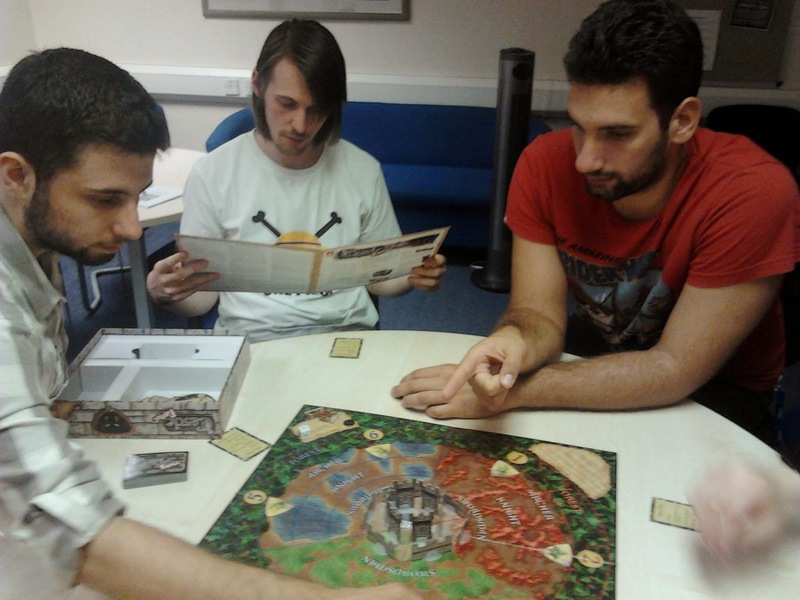 Naturally, we did this over board games which included Once Upon a Time, Castle Panic, Talisman, Jenga, Resistance and a racing board game that had us all in laughing fits at how slow the game was. In the London tube I horrified the english by playing the augmented reality game Face Raiders on a friend's nintendo and learned my lesson on gaming and social conventions. On my own I've played Don't Starve, Prison Architect, Pathogen and Threes with Don't Starve quickly becoming a personal favourite. A lot of these were played on the way to EGX in London where we discovered gems like Mushroom 11, Lumino City and Never Alone. These personal discoveries at EGX are magnificent games that deserve their own blog post but that falls outside the scope of this particular post. Just an hour into the course and we were already designing and pitching game concepts on the spot. Among a team of four and the key words "burglary" and "fear", we came up with the idea of creating an oculus game all in 5 minutes. You play a mansion owner on a dark, stormy night who's home has been broken into by a burglar. 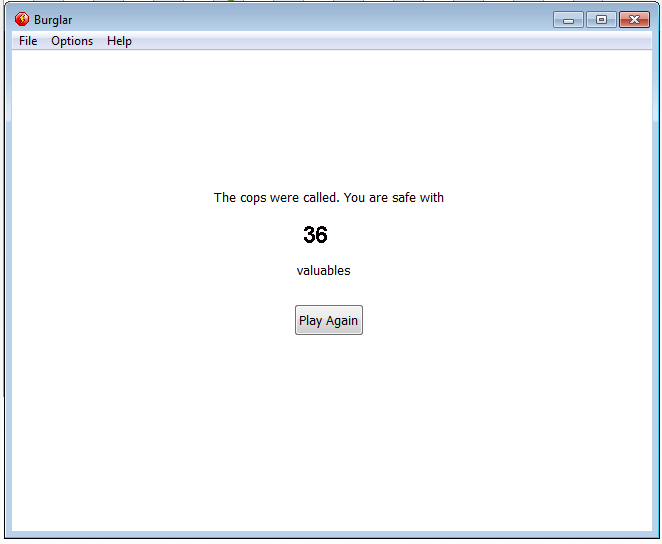 The goal of the game is to get to the phone without either coming across the burglar or loosing all your possessions. While you look at a possession, it is safe from the burglar. Look away though and the next time you look back, it might be gone. After the class, Tim and I decided to try and make a simplification of the game on MMF 2.5, mainly to learn how to use the program. First I drew a sketch of a top-down, Monaco-styled game which Tim set up to start creating on the software. I decided that the both of us working on creating the same mechanic would be redundant so I began experimenting with various tutorials to get the hang of MMF. 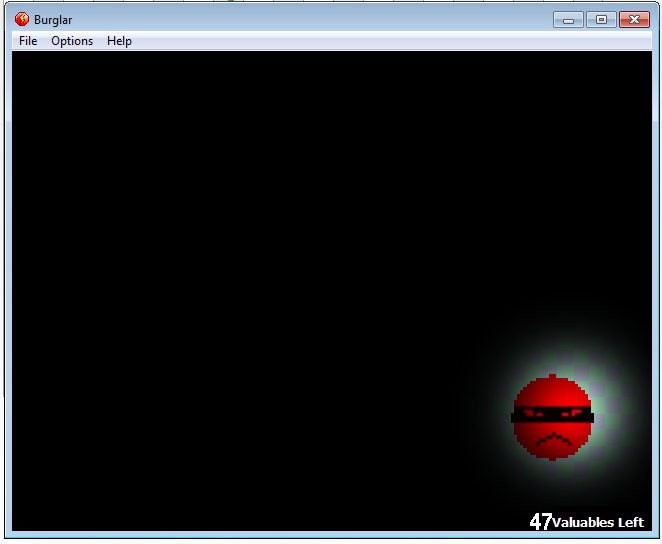 One of the first things learned was frame scrolling, followed by having an object follow the mouse. By making that object be a large black image with a transparent centre, I managed to make it look like I was shining a flashlight onto a surface. 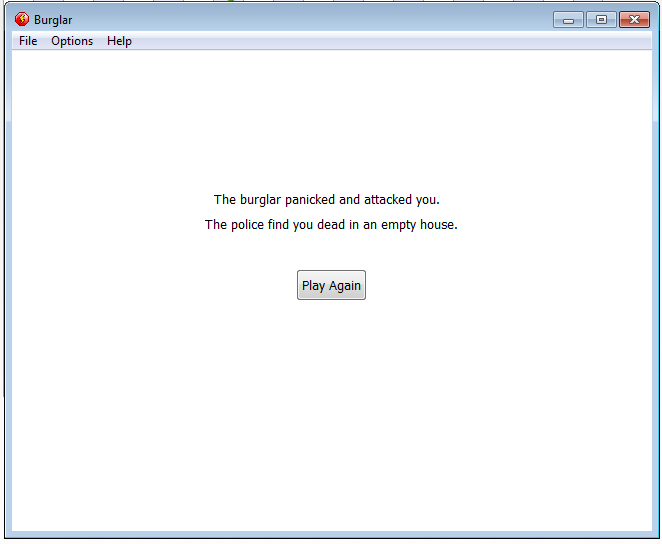 At this point is when I realised I had worked out a first-person mechanic for the burglar game. I created a burglar icon that would randomly move across the play area. When it came in contact with your cursor, the game would end. When the burglar was near your mouse, you'd hear footsteps. 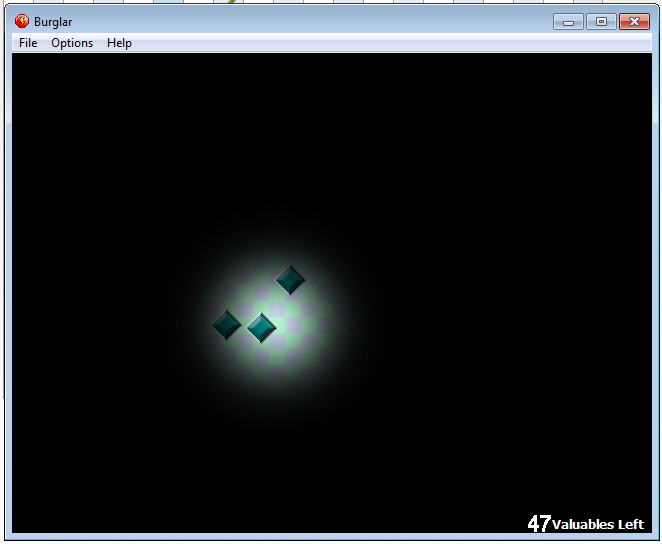 Then I created a series of "valuables" that would randomly scatter at the beginning of the game. Whenever the burglar came in contact with one, it would disappear and you would loose a point. 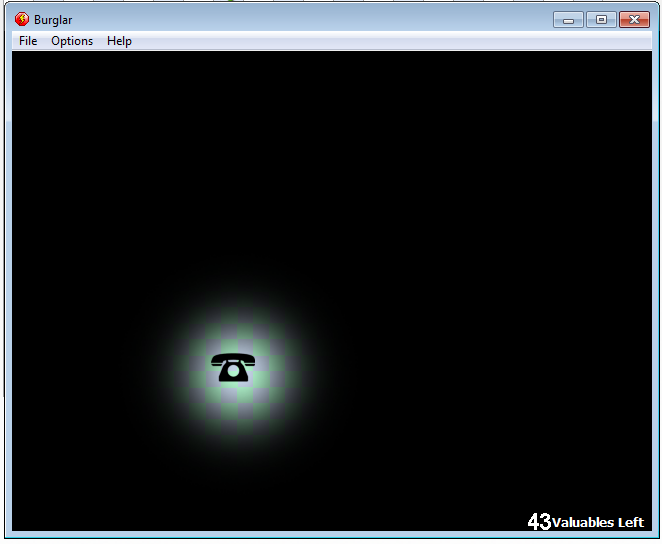 Finally, I created a telephone that would randomly spawn on the play area. When you find and click on it, you'd ring the police and win. It took me an afternoon and half the night to make it, most of which was figuring how to do things and the rest refining the behaviour of the burglar and the collision detection to create better gaming experiences. For example, the burglar slows when they are near you so there is more skill involved in avoiding them. Also, I've made the collision area of the cursor smaller so there might be instances of panic where you catch a glimpse of the burglar before they, or you, escape. Overall it was quite an entertaining game to create especially as it gave me the opportunity to learn from students in other years during the process, whether it was playing their game demos or asking for technical help. The computer lab at this university houses a very creative community and I can definitely see myself spending most of my time here. A suggestion that was put forward to me by a generous game player was the thought that controlling a character with the keyboard and the direction of its flashlight with the mouse would make the game more coherent. It would feel less like "shining a light from the cieling onto a floor". I found myself agreeing with him as this also means that I could play with the speed of the character and therefore the feel of the context. Perhaps this should be a project for next week.